PhD scholarships are available at any time. 1 Marsden funded PhD available from 1 July 2018 onwards. Please contact the individual researchers or have a look at our open positions page. For the 2014 CTCP group photo please scroll down. 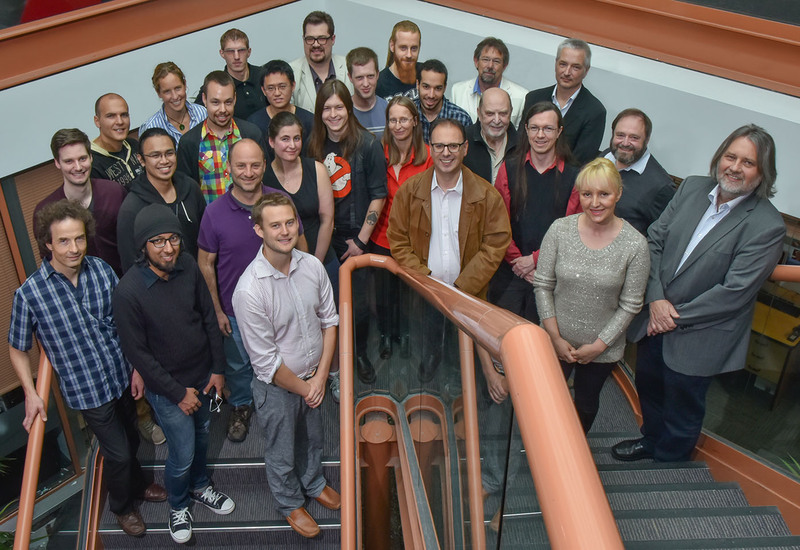 Our research centre (from the left to the right): Joachim Brand, Lukas Trombach, Oleksandr Fialko, Jayson G. Cosme, Ashar Malik, Jane Allison, Lukas Pasteka, Lukas Wirz, Nikos Lazarides (Visitor), Andrew Punnet, Xiaoquan Yu, Sophie Shamailov, Joshua Bodyfelt, Elisey Kobzev, Ivan Welsh, Elke Pahl, Carlo Danieli, William Irvine, Ali Alavi (Visitor), Gaven Martin (Head of Institute), Boris Pavlov, Patrick Bowman, Sergej Flach, Vesna Davidovic-Alexander (Secretary), Boris Altschuler (Visitor), Peter Schwerdtfeger (Director of CTCP).